BEIRUT - Mr Saad Hariri's resignation as Lebanon's prime minister a week ago has sent shock waves across a region that is already facing heightened tensions between Saudi Arabia and Iran. The two countries back opposing sides in power struggles from Lebanon and Syria to Yemen. The long-simmering rivalry threatens to boil over, with Lebanon caught in the crosshairs. In his first public comments since announcing his resignation, Mr Hariri said on Sunday (Nov 12) that he would return to Beirut from Riyadh "in two or three days", brushing aside rumours that he was under de facto house arrest in Saudi Arabia. How did the crisis in Lebanon start? It began when Lebanon's Prime Minister Saad Hariri unexpectedly resigned on Nov 4 , saying in a televised speech from Saudi Arabia that he feared assassination and accused Iran and its proxy Hizbollah of destabilising the country and the region. His father, a long-serving former prime minister, was killed by a bomb in 2005. Mr Hariri's departure came after a surprise summons to Riyadh and caused wild speculation in Lebanon. President Michel Aoun refused to accept his resignation and politicians across the political spectrum claimed that his hand was forced by Saudi Arabia. Hizbollah chief Hassan Nasrallah, whose movement is part of Mr Hariri's government but backed by Riyadh's arch-rival Teheran, said on Nov 10 that Mr Hariri was "detained in Saudi Arabia, he is banned from returning to Lebanon". Saudi Arabia, denying that Mr Hariri was being held against his will or that he had been forced to resign, accused Lebanon of declaring war against it. It advised its citizens not to visit Lebanon and those there to leave as soon as possible. The Hizbollah chief countered that it was Saudi Arabia that had declared war on Lebanon. The resignation came amid heightened tension between Iran and Saudi Arabia, and coincided with an aggressive purge of rivals by Saudi Crown Prince Mohamed Salman under an anti-corruption drive. What did Mr Hariri do or say after his resignation? He has spent the past week in a string of meetings with diplomats and Saudi officials in Riyadh, punctuated by a single trip to Abu Dhabi. On Saturday (Nov 11), he attended a reception ceremony for Saudi King Salman who had arrived in Riyadh from the holy city of Medina. In his interview with his party's Future TV on Sunday, Mr Harir said he is “free” in Saudi Arabia and will return to Lebanon “very soon”. He brushed aside rumours that he was under de facto house arrest in the kingdom, from which he announced his surprise departure. “I am free here. If I want to travel tomorrow, I will,” he said. “I will return to Lebanon very soon,” he said, adding later that he would land in Beirut “in two or three days”. He also said: "We cannot continue in Lebanon in a situation where Iran interferes in all Arab countries, and that there's a political faction that interferes alongside it. 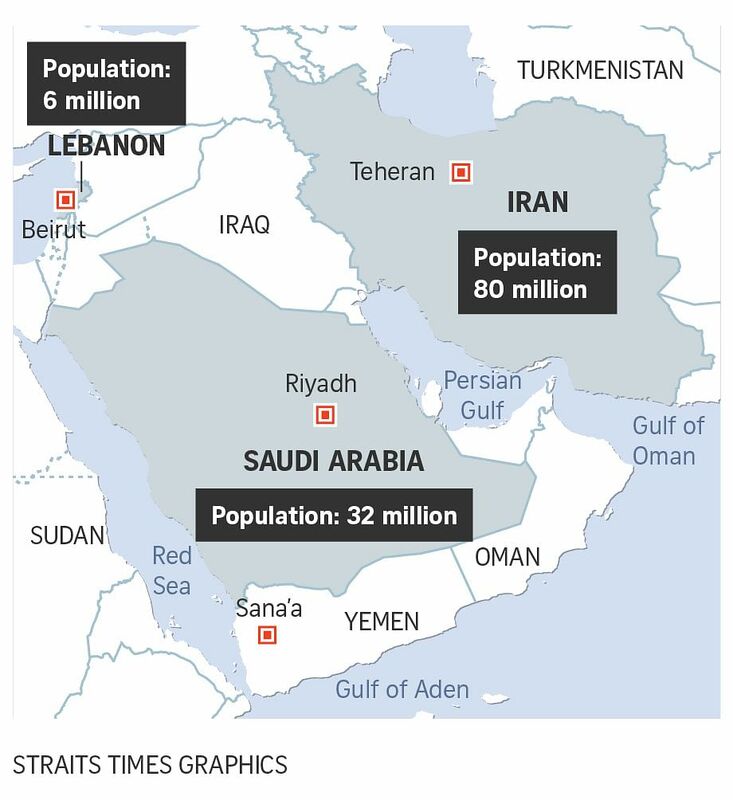 "Maybe there's a regional conflict between Arab countries and Iran. We're a small country. Why put ourselves in the middle?" . He also said he has "excellent" ties with Saudi Crown Prince Mohammed bin Salman, in an apparent effort to put to rest rumours that the Saudi crown prince had pressured him to step down. Could there be a war? Even before the resignation, analysts and officials in the region had been increasingly anxious about what they saw as a volatile combination: an impulsive, youthful Saudi leader in Crown Prince Mohammed escalating threats to roll back growing Iranian influence, an equally impulsive Trump administration signaling broad agreement with Saudi policies, and increasingly pointed warnings from Israel that it may eventually fight another war with Hizbollah. No one expects Saudi Arabia, which is mired in a war in Yemen, to start another war itself. Israel, which fought a war with Hizbollah in 2006, has been expressing increasing concern about Hizbollah's growing arsenal on its northern border. But there are no signs of war preparations in Israel. The country is not mobilising troops on its northern border or calling up reservists, and its leadership has given no indication that a conflict is imminent. However, many Israelis fear that the aggressive actions by the Saudi crown prince could drag Israel into a war it does not want. Israel's war planners predict that the next war with Hizbollah may be catastrophic, particularly if it lasts more than a few days. Hizbollah has more than 120,000 rockets and missiles, Israel estimates, enough to overwhelm Israeli missile defences. Many of them are long-range and accurate enough to bring down Tel Aviv high-rises, sink offshore gas platforms, knock out Ben-Gurion Airport or level landmark buildings across Israel. As for the Hizbollah, it is not necessarily hankering for battle with Israel, according to analysts. It is still fighting in Syria, where it has been backing the government of President Bashar Assad, and it is being drained by medical costs for wounded fighters and survivor benefits for the families of those killed. "Hezbollah as an organisation is in a very deep economic crisis today," according to Giora Eiland, a retired Israeli major general and former head of the country's National Security Council. "But at the same time, the weaker they are, the more dependent they are on Iranian assistance - so they might have to comply with Iran's instructions." There have long been fears that now that the Syrian war - in which Hizbollah played a decisive role, gaining new influence, power and weapons - is almost over, Hizbollah's enemies might seek to cut it down to size. Analysts say a new war in the region is unlikely but some have warned that the increased tensions could provoke an economic crisis or even start a war accidentally. Miscalculations have started wars before, as in the 2006 war between Israel and Hezbollah.